"Maybe we could open up a little place here. I could ruin the food, you could scare away the customers." Stars: Dennis Quaid, Louis Gossett Jr.
After completing 1981's submarine thriller Das Boot and its fantasy successor The Never Ending Story, director Wolfgang Petersen took his turn at a science fiction story with Enemy Mine, based on the novella by Barry Longyear. The film had originally been shot in Iceland before a fallout between the previous director and the producers shut the project down. Petersen started from scratch when he came on board, moving the production to Hungary, where labour to build the elaborate sets was cheaper. It is the late twenty-first century, and by this time mankind has resolved its own racial and political conflicts, and now lives peacefully amidst itself. With Earth as a distant memory of folklore, the human race has expanded into space, colonizing habitable planets throughout the galaxy. They are not alone. Unisexual creatures known as the Drac are claiming squatter's rights to many of the planets the Earthlings want to claim as their own, and war is on. Willis Davidge (Dennis Quaid) is a fighter pilot stationed near a group of planets engaged in battle with the Drac. During one mission he crash lands while chasing down an enemy craft, which also crashes on the unexplored planet's surface. With his copilot dead (Lance Kerwin of James at 15 as Joey Wooster, who recites an unmemorable diatribe on name calling in his dying breaths), Davidge seeks revenge on his Drac foe (Lou Gosset Jr.), but after a failed assassination attempt, becomes a prisoner instead. When a meteor storm threatens to kill both survivors, they are forced to work together to save their lives and, as they come to realize their shared situation on this desolate world, an uneasy alliance grows out of inbred hatred and fear. Time passes; the two begin to learn about each other's culture, and a friendship emerges, but when Davidge eventually decides to strike out on his own in search of other life on the planet, what he discovers will test the limits of their friendship. While Enemy Mine features some great makeup effects, elaborate sets and a noble story of overcoming prejudice, its tendency to be oversentimental undermines what could have been a much better film. There are some pretty substantial elements that we are expected to accept at face value, the most glaring example being the idea that this alien world has a breathable atmosphere despite heavy volcanic activity and frequent meteor showers. Although it is not alone in this often-used condition, it doesn't lend the film much scientific credence. The basic premise of the story also has flaws: if mankind has been able to overcome its own prejudices against its fellow man, why should there be a fundamental hatred of the Drac? In the beasties department, we also get a poor re-iteration of the Sarlaac from Return Of The Jedi as a native monster dwelling underground that creates its own Pit of Carkoon on the alien world, which noteably elevates the fromage factor. Since the majority of the film is carried by only two actors, the development of their relationship forms the basis of the plot, with what little action involved used to move their friendship and reliance on one another along, which might put most younger viewers off. The studio didn't help matters by insisting that an actual mine be written into the story, as they felt the audience couldn't understand that the "mine" in the title was possesive, and not a noun. The language level also targets a more mature audience, and the infrequent, though sometimes witty, humor may not be to everyone's taste. While things get a bit more interesting in the latter half of the film—once Brion James' (Blade Runner) character is introduced—the end result is somewhat unsatisfying, at least to this reviewer. Image Transfer Review: The anamorphic image is very clean and well detailed, with decent color saturation and no sign of edge enhancement. Some grain is evident, though realistically rendered. Black levels are fine, with only minimal loss in shadow detail. Fans of the film should be quite happy with the presentation. Audio Transfer Review: The featured English audio is presented in 4.0 surround, and the soundtrack is enveloping with Maurice Jarre's score well rendered. There is some low level hiss present in the center channel, and the occasional breakup in the front left and right channels, though nothing major. The Dolby Surround track is more forward focused, as is the French track, which also appears to be in very good shape. Extras Review: A very minimal still gallery is included, though the photos do capture some rare behind the scenes moments. The theatrical trailer is here in full frame, looking substantially less impressive than the feature. A collection of trailers for Aliens, Alien Nation, The Abyss, Independence Day and Zardoz is also gathered in the Fox Flix section. 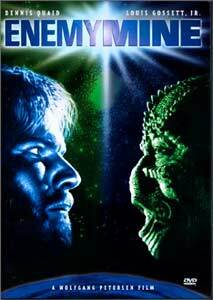 A bit too heavy on the moral tale and saccharine level, Enemy Mine is interesting for the character development and makeup effects, though the acting tends to be overdone. The film does have a lot of fans, and its presentation here is better than expected. While I can't count this among my favorite sci-fi titles, it is still nice to know that it has been released with a decent transfer, and hopefully will join a growing list of SF films that, while perhaps not all perfect, round out a collection of the genre.